"Watermark" is an extremely spacious trawler with a great layout she has everything you could look for in a good cruising vessel; a spacious aft deck with a large cockpit aft where everything you do on the water is conveniently and safely done. The layout is exceptionally good with a huge flybridge deck capable of entertaining many people, the perfect aft deck with the large cockpit below. The salon and the galley are open to each other and give a very spacious and open feeling. The pilothouse area has a day head and comfortable seating for the captain's guests. Going below you pass between the split engine rooms to the huge and very comfortable master stateroom. This layout works so very well in many, many ways. 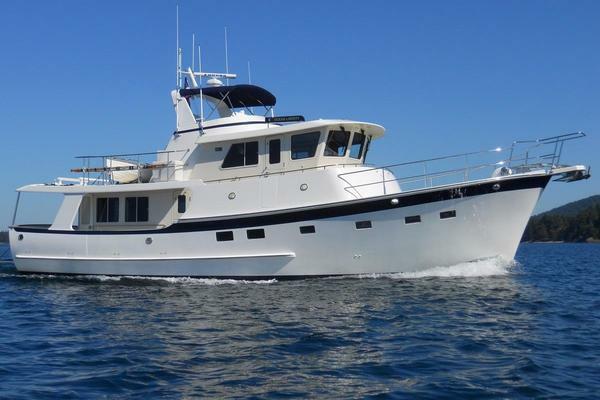 This outstanding DeFever designed trawler yacht is in excellent condition with many upgrades and some very nice custom touches. She is built off the DeFever 54 hull and with the addition of the cockpit provides everything you need for happy family cruising. Her interior stands out with elegant wood work and very attractive navy-blue leather upholstery. Among the many improvements are low hours (SMOH) Detroit Diesel motors, a just finished awl grip paint job, newer electronics and much more. "Watermark" has been knowledgeably and conscientiously maintained and updated for the past 16 years by her well experienced owner. The attention to detail and custom touches are evident everywhere you look. “Watermark” must be seen to be fully appreciated. 90% of the main deck has been renovated to new condition and modernized with a contemporary open floor plan. 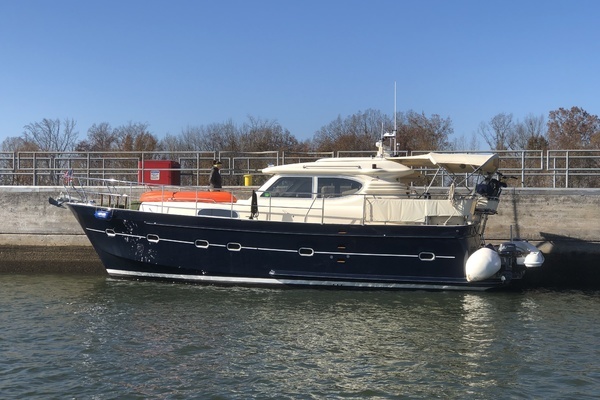 Everywhere you look something has been updated or rebuilt to a very high standard and She is an excellent yacht for family cruising and She represents an excellent value in today's long range cruiser market.Please come inspect "Watermark", you will be impressed and will want to buy her! HUGE PRICE REDUCTION! The Owner's motivation to sell is reflected in the new price of $319,000. This fine vessel's condition stands head and shoulders above the others in it's class and is now anOUTSTANDING VALUE! United Yacht Sales New Jersey would love to guide you through a personal showing of this 60' Defever Flush Deck/cockpit Trawler 1984. This yacht for sale is located in Stuart, Florida and priced at $319,000. For a showing please contact us by filling out the form on this page and we will get back to you shortly! As you board "WATERMARK" from the generous custom swim platform and into the fishing cockpit is a vintage Rybovich Fighting chair along with custom bait station and all new mahogany cap rails and rod holders all on new fiberglass deck with (3) large aluminum lazarette access hatches. Four steps up to the aft deck is a custom settee and table with custom mahogany overhang and teak ladder to fly bridge. Entering the salon thru arched teak doors is an open floor plan with leather L-settee, custom dining area and a stainless steel kitchen with granite flooring. All surface areas are Corian with sea rails. All seating is matched navy blue leather. The all teak helm with Corian tops and navy blue leather Stidd Chair is accented with all LED lighting. Adjacent to the starboard helm door is a day head. From the galley area stairs descend below to a split engine room hallway aft to a full beam master. Forward of the helm is the stair case to below and a custom bar to port Thru either helm door to side decks forward is an expansive bow area with large seating area, commanding pulpit and windlass with stainless anchor as well as custom table with ships bell All cushions and covers are custom fit Sumbrella. The flybridge is accessed either by aft deck or pilothouse ladders. It enjoys two large L-shaped seating areas with Sunbrella cushions and covers as well as a custom steering station. To aft is a custom "picnic table" with seating for 8 with Sunbrella covers and cushions. The dual stand up engine rooms enjoy (2) access doors each with viewing ports. Forward of the engine rooms are mirror image staterooms with dual bunks.